Five people are killed after a house party gets lethal in Measure of Darkness. A confrontation between neighbors kills three including one of the combatants. A six-year-old is hit in his bed from crossfire. In the ensuing uproar, another party guest is run down in the street by a panicked young girl. But what of the girl found hidden in a shed strangled? Coroner investigator, Clay Edison, is trying to determine the former name of the car victim to find her next of kin. Born a male and living on the street as female, the trans community shuts down Clay’s search for her parents. In the meantime, Clay hunts for the strangulation victim’s identity and the reason for her death. Isaiah is targeted as the shooter when he goes to the hospital for a gunshot wound. He, one of the dead and their childhood friends Tuan can be seen on the many YouTube videos showing the confrontation. Tuan has fled. In the video, returning Tuan’s fire is Dane who is also in the wind. Clay and Amy have their parents over for Christmas dinner. Luke, Clay’s just out of prison brother announces his engagement to surprise guest Andrea. This is second book in the Clay Edison series after Crime Scene (review here). The books do not have to be read in order. The conclusion is twisty and satisfying. 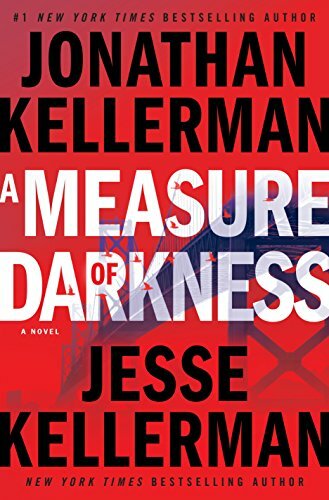 Giving a coroner investigator’s viewpoint within a traditional police procedural, Measure of Darkness is highly recommended to mystery fans. 4 stars! Thanks to the publisher, Ballantine, and NetGalley for an advanced copy.